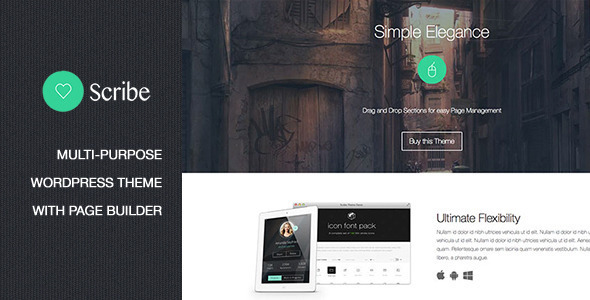 Introducing Scribe – a powerful WordPress theme with a drag & drop page builder. Scribe is fully responsive built on twitter bootstrap. A great theme to show off apps or just about anything really. This entry was posted in Software, Technology and tagged ajax, app, business, drag and drop, layered slider, page builder, parallax, rotating headings, showcase, technology on October 11, 2014 by Vera Jaman. 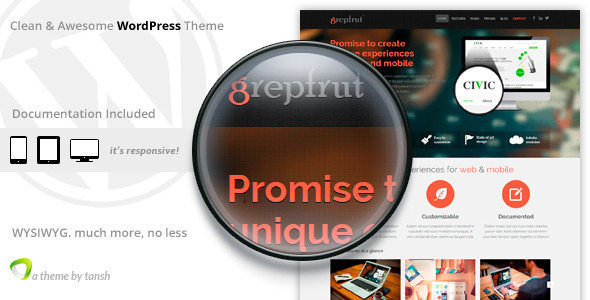 Grepfrut is a minimal and bold software wordpress theme. This entry was posted in Software, Technology and tagged app, bold, clean, ipad, iphone, minimal, mobile, modern, software, technology, translation, widget, wordpress on October 11, 2014 by Vera Jaman. 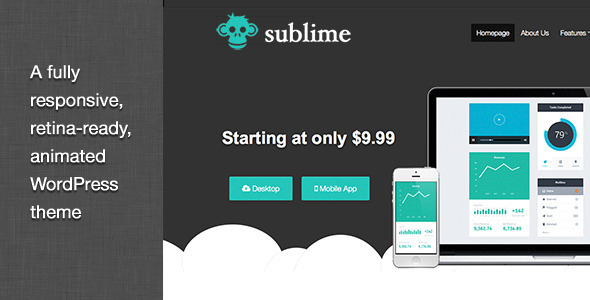 Introducing Sublime, an new, ultra-new clean WordPress theme featuring drag & drop page builder! Fully Responsive – Built on the rock solid Twitter Bootstrap platform. 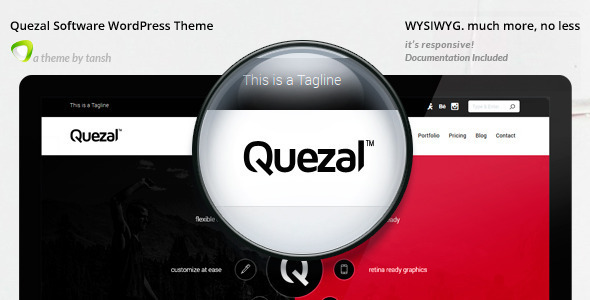 Customizer with Live Preview – Sublime leverages WordPress capabilities to their fullest with a live preview customizer. Translation Ready – Includes .mo and .po language files. Unlimited Colors – You can select any highlight color from the theme customizer. Unlimited Sidebars – Sublime uses dynamic sidebars so you can create a new sidebar for any page or post for maximum flexibility. 600+ Fonts – Choose from literally hundreds of google font options. This entry was posted in Software, Technology and tagged advanced options, custom blocks, customizer, drag and drop, modern, page builder, responsive, revolution slider, unlimited colors, unlimited sidebars, unlimited templates, video support, wordpress on October 10, 2014 by Vera Jaman. This entry was posted in Software, Technology and tagged android, animation, app, App Showcase, clean, iOS 7, landing page, responsive, retina, windows phone on October 9, 2014 by Vera Jaman. 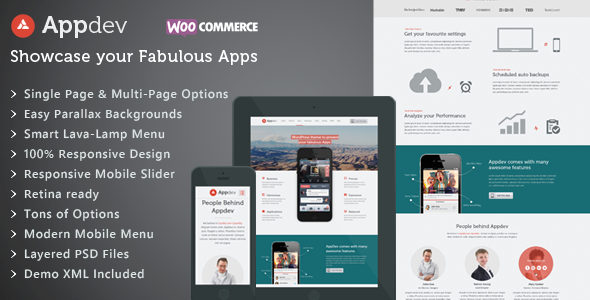 This entry was posted in Software, Technology and tagged business, composer, options panel, page builder, responsive, retina ready, revolution, shop, software, unlimited sidebars, widget ready, woocommerce on September 18, 2014 by Vera Jaman. 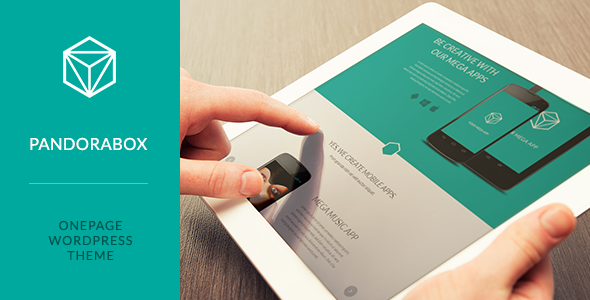 Pandora Box – creative and minimal onepage WordPress Template for mobile developers. This entry was posted in Software, Technology and tagged app, apps, clean, clear, creative, develop, development, elegant, minimal, mobile, modern, onepage on September 18, 2014 by Vera Jaman. Appdev is a perfect one page theme for mobile app developers to showcase their work. Built on top of the a clean, modular framework, Appdev has multitude of features that you can leverage to to build a site to act as a launchpad for iPhone, iPad (iOS) or Android apps. The author did a thorough study of requirements of app developers by studying scores of actual app showcase sites, themes etc. Lots of hours of hard work has gone into this theme to make it THE theme that any app developer/marketer would want to use. 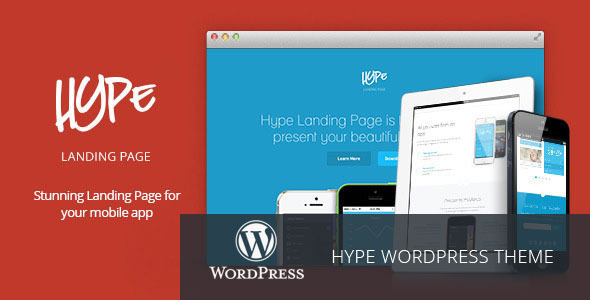 Appdev is currently designed as a one page site but it can even be used to power a multi page site just as easily. It even lets you have multiple single pages, each with auto-built top menu navigation to internal sections. The framework powering Appdev is designed to offer maximum help in coming up a unique looking, easily navigable site – easy custom headings for each page/post with option to enter custom backgrounds and/or custom HTML, easy to create uniquely styled page segments with custom parallax backgrounds spanning the entire browser width, wide 12 column 1140px responsive grid that scales down smoothly all the way down to 320px smartphone screen, smart tracking animated LavaLamp menu, great looking yet easy to use auto-generated menu for smartphones and tablets, multiple touch enabled smartphone sliders to showcase your apps and so on. And, Appdev theme does not skimp on regular features – 70+ useful shortcodes, multi-language support, responsive and retina ready framework, easy demo site replication (demo data included),500+ quality retina ready font icons, portfolio support with custom fields, 500+ fonts, lots of page templates and custom widgets, nice animations and hover effects, multiple sliders including slider revolution, detailed documentation, dedicated support forum etc. This entry was posted in Software, Technology and tagged android app, app, app developer, app launch, app marketing, App Showcase, app website, appdev, appstore, iOS app, ipad app, iphone app, landing page, mobile app, startup on September 8, 2014 by Vera Jaman. 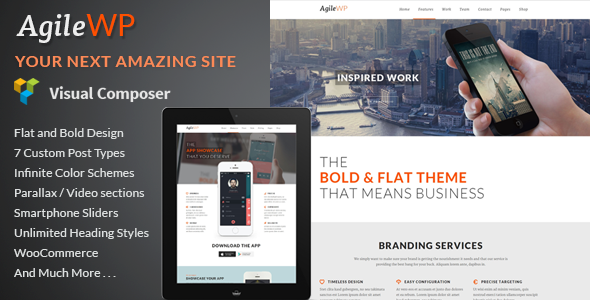 Agile MultiPurpose App Showcase WordPress Theme has proved to be one of the most popular multi-purpose themes of recent times in ThemeForest. Its stunning design, clean typography and rich features has resulted in Agile being used across surprisingly wide variety of domains – product showcase, mobile app showcase, design agencies, personal portfolio, corporates, photography, college or schools, small businesses, restaurants, travel, real estate, lawyer or law firms, medical health, sports etc. This entry was posted in Software, Technology and tagged academy, android app, App Showcase, app website, college, hotel, iOS app, iphone app, landing page, medical, mobile app, product showcase, restaurant, school, travel on September 8, 2014 by Vera Jaman. 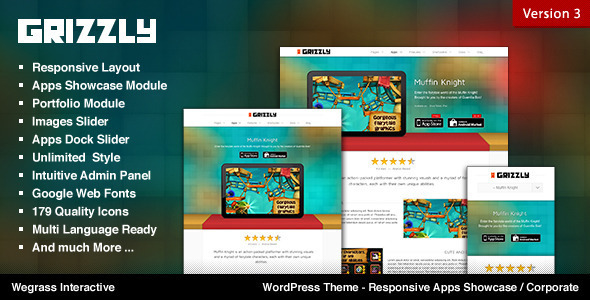 Girzzly is a Responsive WordPress theme crafted for App Showcase / Corporate web site. Support various mobile platform. Unlimited Styles and Easy to Customize. This entry was posted in Software, Technology and tagged agency, android, app, apps, business, corporate, ios, ipad, iphone, portfolio, pricing table, responsive, showcase, theme, wordpress on September 8, 2014 by Vera Jaman.